The boy clutched the phone at the perfect angle: there would be optimal sunlight and no over-elongated forearms. The edges of the frame would be kissed by the snowy peaks of the Karakorum mountains, with gaps colored deep blue. It was, frankly, spot-on selfie technique. I bit down a proud smile. My friend looked impressed. “Who taught you how to do that?” she asked the boy. He scanned the area. His cheeks in perpetual blush, dusted with freckles and enclosing a toothy smile. We locked gazes. I shook my head; he opened his mouth to reply. “Hola, didi!” the boy yelled. I was the only one who taught Spanish. A few people turned my way. He ran over to me and tugged on my sleeve. “This didi taught me how!” I smiled sheepishly. As a volunteer with Round Square International, I taught Class 3 students in the Lamdon Model School in Thiksey, Ladakh one word of Spanish and how to take a selfie. Besides my minor trauma, I remember this moment because it says something important about these children. They love to learn and see knowledge as dynamic, something meant to extend beyond the classroom. Thiksey’s Lamdon School is a satellite of the Lamdon School in Leh, Ladakh which was founded in 1973 by the Lamdon Social Welfare Society, a grassroots NGO. The school’s aim is to make education more accessible to the Ladakhi community; Lamdon provides boarding and bus services to ensure mountainous terrain and remoteness of villages pose no obstacle to education. 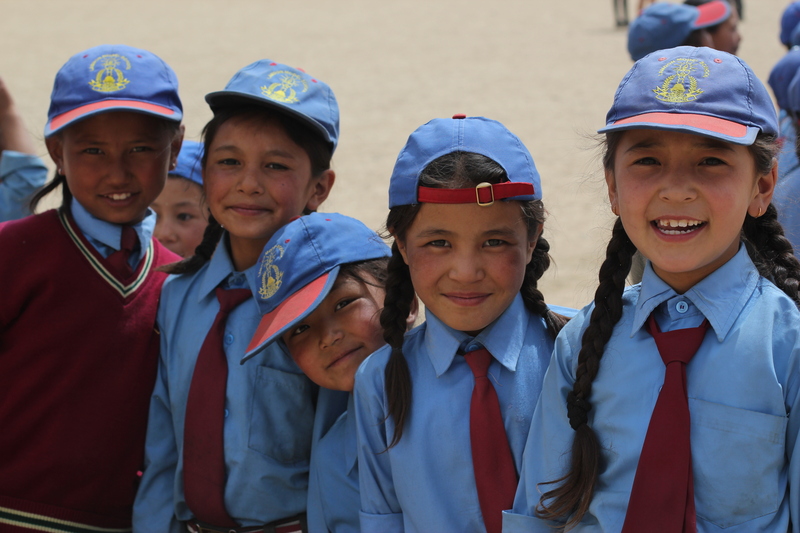 Today, Leh’s Lamdon School educates nearly 3000 children from UKG to 12th grade. 500 students across both schools receive financial aid from individual benefactors and school groups around the world. Central to the school’s mission is the preservation of Ladakhi cultural heritage among new generations. This aim is of particular importance given Ladakh’s rich religious and ethnic diversity. Sharing borders with Pakistan and China, Ladakh used to be transit hub in South Asian trade. Ladakh’s legacy as a trade crossroads is a mixed population of Tibetan Buddhists, Sunni and Shiite Muslims, Hindus and even Moravian Christians. We can take Leh’s central market as a microcosm of the region: a Sunni and a Shiite mosque stand harmoniously within a kilometer of each other. This peace is particularly impressive given geopolitical tensions in the region. Ladakh became ‘Little Tibet’ after the 1960s. In 1950, the Chinese People’s Liberation Army invaded the Kingdom of Tibet, an independent state led by the 14th Dalai Lama, and imposed limits on religious and social freedom. Relations between Tibetans and PLA worsened daily, climaxing in an armed uprising of Tibetan rebels against the Chinese in 1959. Guerrilla clashes continue to this day. Since the 1959 Tibetan Rebellion, nearly 130,000 Tibetans have taken refuge in parts of northern India, including the 14th Dalai Lama, who leads a government-in-exile from Dharamsala. From a violent history, Tibetans forged a peaceful future. Underpinning Ladakhi religious harmony is an immensely amicable population. A cheerful Julley! (hello), even if delivered from a taxi window, will be reciprocated by locals. They share a good rapport with tourists, who often stay for months on end and adopt a similar lifestyle to Ladakhis, with a bohemian twist. “The friends that I have made over the years are just very nice people – in the real sense of nice.” said Ms. Tony Hyde, a mountaineer, former teacher and guardian of Round Square International’s service trips to Ladakh. He found it difficult to further describe the friends he has made since 1991, when he began trekking and doing service in the region. Reflecting the pursuit of a cultural education, morning announcements at Lamdon are littered with poems, current affairs and prayers. Enclosed by a U-shaped, single-story school building, 100 maroon-blazered students aged four to fourteen chant harmoniously in the courtyard. Even as the sun beats down, distorting the horizon, and gusts of wind rise across the rocky landscape, the prayers are mesmerizing. The momentary reverie is followed by morning announcements, delivered in a single-breath and punctuated with a flustered, triumphant “Thank you!”. Children are no less eager to participate in the classroom. They latch onto knowledge with a ferocity. When asked what languages they speak, we heard English, Hindi, Ladakhi and… French. The kids remembered snippets of French taught to them by a student volunteer group from 2012. Even during a discussion about water conservation, which would have most kids wistfully looking out the window, my third graders flung their hands in the air to answer, nearly falling from their desks. Grateful, giving and curious, these kids enter to learn and leave to serve. Their career ambitions present a pleasing lack of diversity: doctor, teacher, police officer and lama. “I want to teach children like my sister and brother, who are too young to attend school here.” said Tonskit Dolma, a Class 4 student. Her family lives in a village along the Zanskar River. After their winter break, some Lamdon students must traverse the frozen river to return to school. If conditions are too severe, the children remain out of schooling for up to six months. Alongside teaching, my Round Square group was helping build another room in the school dormitory. At the construction site, I often saw Lamdon students lingering, keen to help out. Until being promptly removed by our supervisors, they would help fill buckets and carry branches. Although a majority of these students come from low-income backgrounds, as children of farmers, laborers or the unemployed, the children give heartily. When the day came for us to leave, we were bombarded with gifts from chocolate to bracelets. The Lamdon School is a non-profit charity. In the principal’s office, alongside a portrait of His Holiness the 14th Dalai Lama is a photo of a bespectacled, white woman. I learnt that she is a French benefactor who visits every year, giving her time and other resources. The school, especially the Thiksey branch, is still in need support. At 11,000 ft Ladakhis are exposed to strong sunlight and ultraviolet radiation. As a result, students are deep and unevenly tanned, sheltered only by scruffy baseball caps. The school needs sunscreen and better hats. Students would also benefit from sunglasses to minimize the risk of developing cataracts later in life. Incoming students from impoverished backgrounds need sponsorship. Accounting for tuition, two meals, bus service, two summer uniforms and two winter uniforms, the fees per year are approximately Rs. 22,000 or USD 330. Any contribution is met with immense gratitude. Despite the school’s material needs, it insists the most valuable donation is that of time. Through Round Square International, gap year programs for secondary school graduates can be organized. Alternatively, you could contact the school administration and organize your own volunteer program. If you happen to be travelling to Ladakh, stop by the Lamdon School in Leh. To visit the Thiksey school, which is across the road from the beautiful Thikse Gompa (monastery), drive another 45 minutes. Ladakh burst into Indian consciousness after the release of 3 Idiots, a blockbuster in which Aamir Khan’s enigmatic and sincere engineer sets up a progressive school near Pangong Lake in Ladakh. Given Lamdon students’ intellectual curiosity and approach to learning, the film’s setting could not have been more fitting.